The bike is one of the best looking bikes on the market and would look good in anyone’s home. However, the design does have a flaw that was addressed in the later versions of the bike. It doesn’t affect everyone but it is worth considering how it might impact on getting the bike to fit you correctly. It comes with belt drive and magnetic resistance that give a very quiet and riding experience, and has a console that provides information to keep you on track during your workout. It certainly has the features for a great spinning or cycling workout, it is one of highest regarded indoor bikes, and in our review we look at just how it really delivers, this includes the adjustability of the bike. The bike weighs a total of 85 lbs with a frame made from steel. This stops the bike from wobbling or flexing while you are riding. There is no concern that the bike might tip over when you are seated, standing or jumping up and down. The bike has a special paint coat and has tracks on the frame to divert and stop sweat corroding the bike so it stays looking good and performing well for longer. This bike does have a very light flywheel at 8 lbs. Most spin bikes have a heavy flywheel of at least 30 lbs and can be perimeter weighted to give more inertia. This helps to pull the legs through a 360 degree cycle motion that is kinder on the joints and is like you get with an outdoor bike. If you are new to spinning or cycling you may find your pedal stroke is more up and down due to changes is speed of the flywheel which can be harder on the joints until you master the pedal stroke. Having said that most people enjoy the smoothness of the ride and describe it to be similar to riding a bike. If the bike is rocking it is possible this is due to an uneven floor. This can be resolved by turning the leveling feet under the rear crossbar to even out the bike. There is little maintenance required on the bike with only the standard checks to make sure everything is tight and wiping down to be done on a regular basis. This is where the M3 Plus and M3i bikes are way ahead of the bike. You can’t move the handlebars horizontally. This is a particular problem with the bike because of its design. As you move the handlebars up or down they move on a 45 degree angle rather than straight up or down. This can take them out of reach or too close. The seat can be moved horizontally and vertically which can help to a certain extent but doesn’t fully compensate in all cases leaving people in uncomfortable positions and not in the best position for long term cycling causing pains and strains. Not everyone is affected by this. The M3 Plus has horizontally adjustable handlebars that counter this movement to ensure you get the best fit for your height and body shape. The adjustments are simple and quick by loosening the T levers on the poles or seat slider and moving the pole to exactly where you want and tightening fully in place. You do need to ensure they are tight to prevent any slipping. The height range people have found the bike is best for is between 4ft 10 ins and 6 ft 5 ins with the caveat above about the handlebars. There are makings on the poles that can help you re-set the bike back to your fitting if it has been changed. The whole process only takes seconds after you’ve set the bike up the first time. This all makes it possible for many different people to use the bike as there is little time needed to get it all ready for use. The magnetic resistance is constant and smooth. It doesn’t feel like you are pushing against the brakes the whole time it on. It can go from easy to very difficult to almost impossible in small increments. The change between increments is even and there is no choppiness. It applies something called the eddy current principle using magnets either side of the flywheel. The lever at the bottom of handlebar is used to move the magnets closer and further away from flywheel. They never touch the flywheel. The closer the magnets and the faster the flywheel the more resistance there is. The console gives you a measure of the level of resistance you have set your resistance at from 1 to 24. This is great feature and unusual for spin bikes, It makes it much easier to determine how hard you have set the resistance. With other bikes you normally are twisting a knob and have to estimate how hard you set it to – which can make it difficult when you are comparing between workouts or wanting to return to a previous setting. There is some variability in the resistance levels as the faster you pedal the more resistance there is like you might find in air resistance and to a certain extent when riding a bike outside. To stop the flywheel quickly you push the lever away from you and a pad stops the wheel within one revolution. The belt drive gives a nice smooth ride that many enjoy. It is different to riding a bike as you don’t have the chain moving across sprockets. It is almost silent or whisper quiet as described in the sales brochure. The drive is non-slip and gives many years of maintenance free riding. At some point the belt will require changing but that is after years of service. For most people this is something you are going to need someone to do for you as it requires specialist tools and knowledge. The bike does have a fixed gear arrangement which means when the flywheel is turning so are the pedals. This means there is no ability to coast with the pedals on the move until you stop the flywheel either by pushing gently back on the pedals, waiting for the flywheel to come to a stop or using the brake. The pedals are combo. One side is for shimano shoes and the other takes normal athletic shoes with toe cages and straps. You can get a secure grip on the pedals using either side of them. The cranks are solid to give you a firm base for pedaling in and out of the saddle. The M3 series bikes have a wide q factor which does mean your ankles, knees and hips aren’t in alignment which can feel unnatural and can cause joint issues for some people. As a general rule the narrower the q-factor the better it is for alignment of the joints (The Spinner NXT has one of the narrowest Q-factor). The q-factor is the horizontal distance between the pedals with the narrower being closer to how people walk and will feel more natural. Noise. This is one of the quietest bikes around. There is little noise from the belt drive and none from the resistance. You won’t disturb anyone else while you cycle with your hard breathing being the loudest noise. If you have young children you may even be able to get in rides while they sleep without waking them. Dust and Dirt. It is a bike that gives off very little in the way of dirt, dust or lubricant but will generate a little and you may also drop sweat as you exert yourself. This can all end up on the bike and floor. To protect the bike it is recommended you clean the bike on a regular basis. The floor can be protected with a rubber mat. Handlebars. The handlebars are fixed in place with aero bars on either side of the console for sprint training. At shoulder width apart are bars that you can rest your hand on when seated or at the ends for more leverage when doing hill climbs. 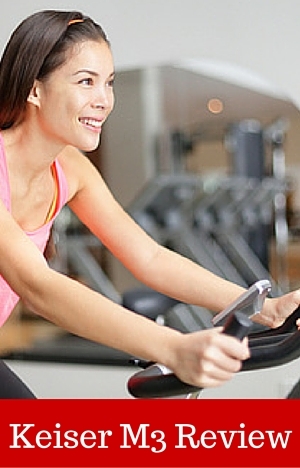 You can put your hands in multiple positions for the different spinning and cycling exercises and workouts. The handlebars are coated to help keep your hands dry for better grip and prevent blisters. There is minimal padding so you can’t rest too hard on them with your arms. Seat. The seat has been designed to be comfortable. However, you may still find it not to your liking as that is the nature of bike seats. This is especially true if you haven’t done a lot of bike riding. To help with this you can buy a gel seat cover or padded bike shorts. It is also possible to replace the seat with a seat kinder to your sit bones as it fits standard bike fitting seats. The bike has 2 transport wheels on the front crossbar that you tip the bike on to when you want to move the bike around. They take most of the weight of the bike. This makes it easy to move and the wheels are far enough apart to help prevent the bike tipping over. The wheels should work on all surfaces as they are not enclosed. They may dent or mark wooden floors so please check before you use wheel it over it. The bike needs a space of 26 by 49 inches for storage. It can be stored under stairs or large cupboards or against the wall when you want it out of the way. Fortunately it does look good so even if you can’t get it completely out of the way you can still admire it for its design! The assembly is more involved than most spin bikes. It can be done in an hour. There are detailed instructions that are well written. You do need to provide your own tools which are listed in the manual. It does recommend a torque wrench for tightening the bolts to the correct tightness. However, people make do with the wrenches they have at home to do this rather than buying one. The frame of the bike is together but you need to put it on the base and add the flywheel, pedals and more to complete the job – I guess this helps with shipping and because it is a commercial bike they expect it to be installed in gyms. It seems most people find it a straightforward job to put together with the weight being the most difficult part. Time to complete for most is between 1 and 2 hours. This is the same console as you get with the M3 Plus. It doesn’t come with much in the way of accessories. It does include a water bottle holder that is at the bottom of the frame. The bottle is held in place by gravity which makes it easy to get the bottle and return. The water bottle position is in a handy place to get to. But there are a couple of issues as it is an area that can get a lot sweat and you may kick it as you dismount the bike. Overall customer reviews are positive. The issues on this bike that are mentioned are the lack of fore/aft adjustment of the handlebars and the console’s lack of data storage and analysis. Both are valid criticisms especially when you consider the premium pricing of the bike. However, a basic console is the norm for spin bike when they have one, whatever the price. The adjustability is not going to affect everyone as people have different body measurements so some can get the bike to fit just right for them. As said earlier the majority of reviews say they really like the bike. They like how quick it can be to set up the smoothness and quietness of the ride along with durability and stability of it. This bike is an expensive bike and is aimed at serious indoor cyclists or spinners. It does have a number of premium features – a console, a magnetic resistance and belt drive. It is priced a $100 below the M3 Plus and $200 below the M3i models. It doesn’t have the horizontal adjustment of both bikes or the bluetooth connectivity that the M3i console has for uploading and analyzing your workouts. This is a bike for people who are serious about their training and workouts. It can be used by those who want moderate exercise or are beginners but it does come at a price. For spinning it has a light flywheel and gives a different feel than a spinner bike so if you are looking for that type of feel this might not be the bike for you. The main issue with the bike is lack of the handlebar horizontal adjustment due to the 45 degree vertical adjustment making them move further away from you as you adjust the bars up. This lack can result in a bike that isn’t properly set for some people. This is why I think spending the extra on the Keiser M3 Plus is the better option. Having said that, for most people wanting a bike where they can train seriously who have good form or work on it this bikes gives a great experience. It is smooth and quiet and durable for many years of quality workouts.